It’s a rare honour to compete at a race meeting named in your honour and Kiwi supervet Ken Smith plans to make the most of it at the eighth annual New Zealand Festival of Motor Racing at Hampton Downs this weekend. At an age – 75 – when most of his contemporaries would be happy to sit in the stands and watch the proceedings – defending SAS Autoparts MSC NZ F5000 Tasman Cup Revival Series champion Smith is set to drive no fewer than five different cars over the three days of the Festival which this year’s celebrates his illustrious 59-year national level career. Smith and circuit owner Tony Quinn are also going to suit up some time during the weekend for a winner-takes-all ‘grudge match’ over membership of the circuit’s exclusive GT club in identical, three-quarter scale Aussie Racing Cars. If Smith wins, Quinn will stump up with a complementary membership, if Quinn wins Smith will – like everyone else – have to pay for the privilege! Both are talented wheelmen and having dominated the SAS Autoparts MSC races at the NZ Festival of Motor Racing meetings on his way to a fourth series title this time last year Smith will enjoy the unique distinction of being firm favourite in the F5000 class races at his own ‘tribute’ meeting. And like his fellow series’ drivers he is very much looking forward to the new challenge the meeting offers, the chance to run on the full 3.8km circuit for the first time. 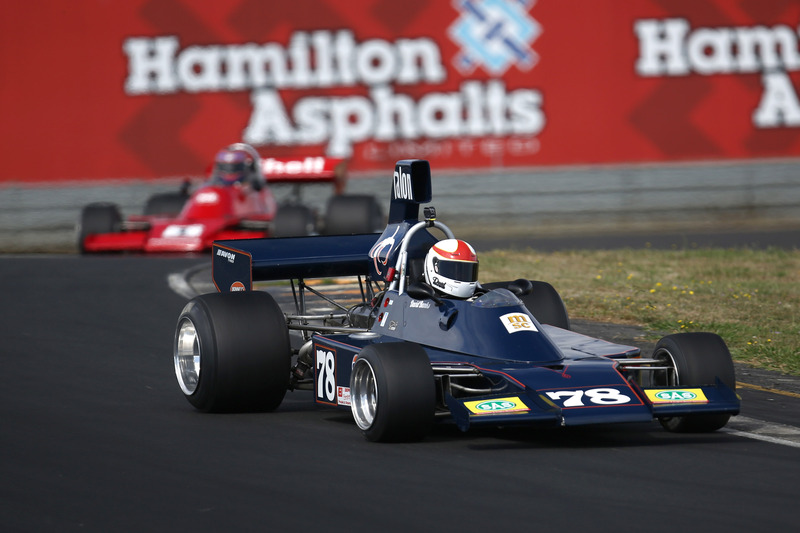 The Festival meeting is only the second to use the new International circuit and fellow class fast man Clark Proctor (March 73A/1) is the only driver in the 26-strong SAS Autoparts MSC NZ F5000 field who has raced on it. In November last year Proctor and co-driver Andrew Porter contested the inaugural Hampton Downs 101 race (a round of the 2016 Australian GT Championship) in a Nissan GT-R35, finishing 11th with a best race lap time of 1.33.972. Proctor believes the lap times from the top runners in the SAS Autoparts MSC F5000 class races this weekend will be similar. Which is music not just to Smith’s ears, but also those of series’ young gun Alan Dunkley (Lola T332). Smith was the pace-setter in the SAS Autoparts MSC F5000 class races at earlier Festival meetings on Hampton Downs’ 2.8 km ‘National’ circuit and has had his eye on the current class (and overall) lap record since young Brit Michael Lyons (Lola T400) took it off him (leaving it at 59.840) in 2012. Aucklander Dunkley first came to notice in the SAS Autoparts MSC F5000 category with some giant-killing drives in a Class A (for older cars) Lola T140, then became a bona fide podium prospect in 2015 when he graduated to an ex Interscope Racing Lola T332 like Smith’s. Smith, Proctor and Dunkley head a 26-strong field heading into this weekend’ SAS Autoparts MSC F5000 series round (the third of five) at the Festival meeting with entries from here, Australia and the UK. Heading the points standings after race wins at the first round of the 2016/17 series in Australia in Perth in October last year is Melbourne ace Bryan Sala driving his Australian-built Matich A50/51. Just two points adrift is Aucklander Grant Martin (Talon MR1/A) with fellow Kiwis Brett Willis from Rotorua (Lola T330), and Glenn Richards (Lola T400) and Aaron Burson (McRae GM1) third, fourth and fifth respectively. Joining Sala on the Australian team contesting the inaugural Trans-Tasman Trophy this weekend are Paul Zazryn (Lola T332), Bill Hemming (Elfin MR8) and Peter Brennan (Lola T330). Joining UK-based series regulars Greg Thornton (Chevron B24) and Mark Dwyer (Lola T332) meanwhile, are Mike Sidgewick in the ex Jody Scheckter Trojan T101 and Chris Atkinson in the ex Mike Hailwood Surtees TS8. Making up the bulk of the field are locally-based drivers Russel Greer from Blenheim and Ian Clements from Christchurch (both Lola T332s) and David Banks (Talon MR1), Peter Burson (McRae GM1), Calven Bonney (Begg 018), Kerry McIntosh (Begg FM2), Frank Karl (McLaren M10B), Tony Roberts (McLaren M10A) and Shayne Windelburn (Lola T400) from Auckland. Getting their first local taste of the series, meanwhile, are Ian Riley from New Plymouth driving an ex Vern Schuppan/Jorgensen Steel Lola T332, and Karl Zohs from Rotorua in his recently acquired Chevron B32. 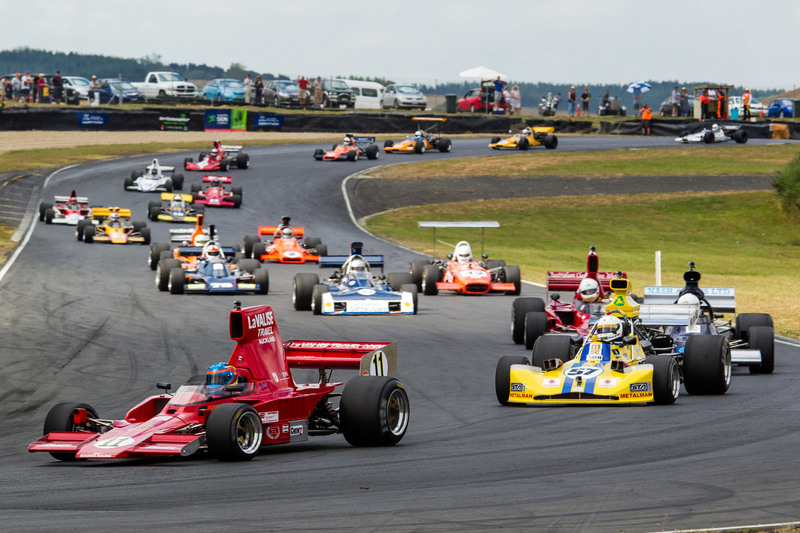 The NZ Festival meeting kicks off a busy three weeks for all those involved with the 2016/17 SAS Autoparts MSC NZ F5000 Tasman Cup Revival Series with the fourth round (and with it the chance to join nine Historic F1 cars on the grid for a special Race of Champions Revival race) at the new Taupo Historic GP meeting at Bruce McLaren Motorsport Park next weekend (Jan 28-29), and the fifth and final round at the annual Skope Classic meeting at Christchurch’s Mike Pero Motorsport Park on February 04 and 05. The inaugural Trans-Tasman Trophy will go to the team which scores the most points over the first four rounds, Perth and Melbourne in Australia, and Hampton Downs and Taupo in New Zealand. Feature photo: Australian driver Paul Zazryn (#24) in his Lola T332. Second photo: Kiwi David Banks (#78) in his Talon MR1. Third photo: Defending SAS Autoparts MSC F5000 Tasman Cup Revival Series title holder Ken Smith (#11) leading the field at Hampton Downs.